Each tumbler is blown into a custom wooden mould and then tailored by hand. A print image is transferred from photoresist and applied to the bottom of each glass. The photoresist is then sandblasted and polished to get a crisp, sharp finish. Subtle yet stunning, these best-sellers can be bought individually, as a set, or can be mixed and matched. Perfect for weddings, bridal showers, retirement gifts, or as a treat for your own sipping pleasure. The photo boxes represent the artist's continuing exploration of the relationship between glass and photography. These hollow glass boxes are blown individually and then covered in a black coloured powder. Photographic images are transferred onto photoresist paper, sized, and then sandblasted onto each box. The results are hauntingly beautiful silhouettes that play with natural light and shadow. These beautiful glass bowls are first hand-blown and treated with colour, which can permeate the entire body or be complimented with a smooth white finish applied to the interior. 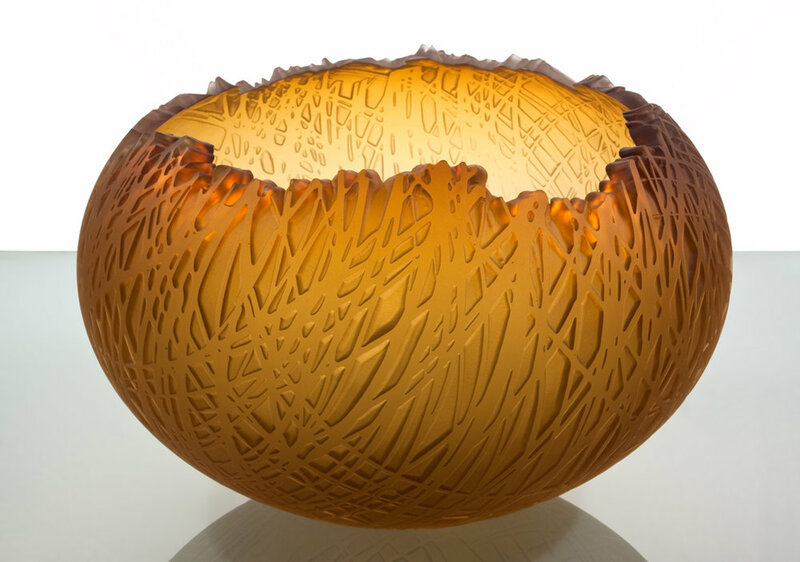 When the glass cools, the surface texture is sandblasted to give the finish a rich, organic texture. The vibrant colours play effervescently with natural light. Prices vary depending on size. The Leaf Vessel series is one of our most popular and well-known designs. The vessels are blown into various sizes and coloured. Original photographs are translated into black and white treated images and then transferred onto photoresist. The images are then sandblasted onto the surface of the glass. This creates a slightly raised, textured surface image with gorgeous, fine detail.